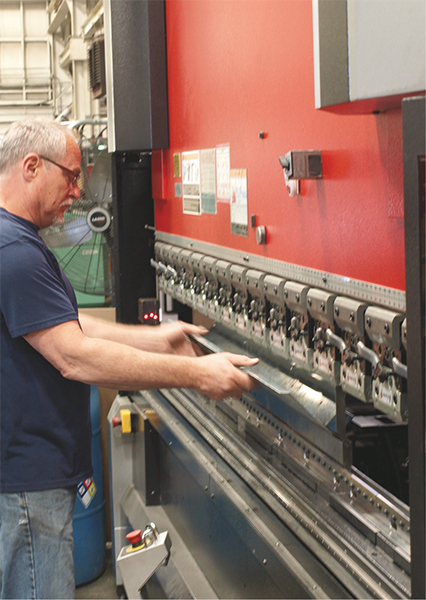 With an order backlog twice what it was a year ago, Weaver Fab & Finishing owner Jim Lauer expects that the firm’s new fiber-laser cutting machine will quickly become fully loaded. The machine, installed earlier this year, is slated to come online with full force through the summer months. We visited the Akron, OH, company late-spring as Lauer and his team not only were gearing up for the new cutting machine but also putting the finishing touches on its new company location. 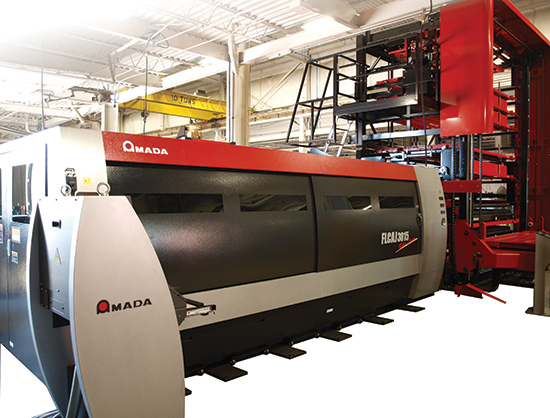 You see, accompanying the new machine (an Amada FLCAJ 3015, with 2-kW fiber-laser resonator) is a six-shelf automated material-handling sheet-storage tower. As it requires 20 ft. of ceiling height, it wouldn’t fit at the previous Weaver Fab facility (32,000 sq. ft. spread over several buildings). Lauer, so committed to the storage tower and already on the prowl for a new manufacturing facility, stepped up his search for a new location at which to hang his hat, and the hat of his wife and company co-owner Marian Lauer. But now, as 16-gauge mild steel has become the company’s sweet spot, combined with a notable increase in the amount of aluminum work it’s bringing in, replacing that aging CO2 machine with the fiber makes sense. The strength of the automotive market and other industries investing in robotics has Weaver busy fabricating parts for Fanuc America. Shown are laser-cut aluminum blanks that Weaver forms and powder-coats. The new laser-cutting machine boasts a three-axis linear-motor drive system and an eight-station automatic nozzle changer. Maximum cutting area: 120.9 by 61 in. The Weaver Fab & Finishing list of 30 to 35 customers stars five or six primary and long-term clients—“the 80-20 rule,” says Jim. Most notable are a few players in the packaging industry, including Automated Packaging Systems (machine frames, cabinets, brackets, etc.). 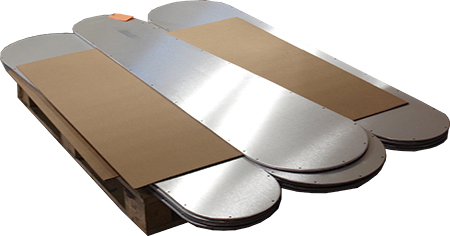 Weaver also fabricates various sheetmetal parts for robotics company Fanuc America. The added variety in sheet materials and thicknesses adds even greater importance to the automated sheet tower, an Amada ASUL model. “It changes how we buy our materials,” says Jim, “allowing us to completely restructure the front end of our company and change how we operate internally. We can work more to a just-in-time model, schedule more accurately and predictably, and minimize or even eliminate deviations from our planned production schedules. Accompanying the new fiber-laser cutting machine at Weaver is this Amada servo-hydraulic press brake. Its thickness-detection system automatically adjusts the entry depth of the forming tool based on sheet thickness. When discussing the justification for investing in the automated material-storage tower for the laser, Jim is quick to note, “We don’t ever want to have a conversation out on the floor about a backup at the laser.” Marian adds that an additional investment was needed to prevent merely moving the potential bottleneck from cutting to bending. Improved bend-angle accuracy, according to Amada officials, is due to the thickness-detection system (TDS) designed to detect the thickness of the workpiece material. The TDS automatically adjusts the entry depth of the forming tool based on sheet thickness, guaranteeing consistent and accurate bending angles. Efficiency gains are clearly evident in every corner of Weaver’s new digs. There’s nothing like a fresh, greenfield approach to plant layout and design. So in addition to the gains created via automated material handling at the laser—“We ran a recent job for 38 hr. straight without human intervention,” Marian says—optimized material flow from the new plant-floor layout also brings significant gains. In addition to laser cutting and press-brake forming, the company also performs roll bending, milling, saw cutting, arc and resistance welding, CNC punching, and powder coating.